According to the US Consumer Product Safety Commission, Kidde recalls Fire Extinguishers with Plastic Handles due to Failure to Discharge and Nozzle Detachment. One death has been reported. Visit the US Consumer Product Safety Commission website to find out if your fire extinguisher is part of the recall. 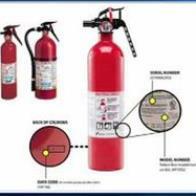 If your model is included in this Fire Extinguisher Recall, the agency provides manufacturer contact information to obtain a replacement extinguisher. Also check out Important Product Safety Recall details on Smoke Alarms! Fire safety equipment is an essential component of everyone’s emergency supplies kit for home and business. Be sure all your safety supplies are up to date!